Neil has held research, advisory, and teaching roles relevant to government, business, and non-profit sector collaboration. As Executive Director of The Intersector Project, Neil supports organizational strategy, research initiatives, and partnership development, and leads external engagement with organizations that share an interest in cross-sector collaboration. 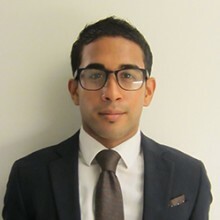 He is also an Adjunct Assistant Professor at the NYU Wagner Graduate School of Public Service, a member of The World Economic Forum community as a Global Shaper, and serves as President of the Concordia Public-Private Partnership Index Task Force. Neil previously worked as a Project Coordinator and Senior Research Assistant for the York University Community Finance Project where he coordinated a research team to assess the accessibility of local financial services, developed publicly available self-assessment resources, and outlined a framework for social performance assessment to support impact evaluation. Neil also worked as a Principal Researcher for the Social Investment Organization of Canada where he collected, organized, and analyzed environmental, social, and governance data from asset management firms to evaluate the state of responsible investment in Canada. Neil studied finance and philosophy at York University in Toronto, Canada and graduated with a Bachelor’s degree with Honors in Administrative Studies and a Certificate in Practical Ethics.